Well, I didn’t get up at 5 like I wanted but at least the card was done. And id I’m lucky, I’ll be able to insert it so you can take a look at it. Lately I’ve been seeing a lot of crafters dishing them out left and right. And I’m like I could do that!! I enjoyed making my card and it didn’t take long. Nor did I think it was. It was a matter of finding time to get it done. The same with a lot of other projects I’m trying to do. I know I’ll get to them eventually. But the sooner the better. My next project is sewing. I have my project ready. I just have to pin my tissue patter onto the fabric, pin it, then cut away. Right now its late and I really need to get to bed. So much to think about it being thanksgiving week. Its also coupon sunday and for the last few weeks I haven’t had any luck of there being inserts in the paper. which has me freaking out and pissed wondering what is going on. SoI have to run to family dollar and hope for the best. Ok, wordpress is changing things up! Kinda hard when you have a new phone too! But like with everything, we have to adapt. I’ve been doing a lot of couponing for my families benefit of course but their also into there changes too. Starting with paperless coupons, on-line rebate apps and more. Just trying to keep up with everything is exhausting. But I’m trying! My life right now is a bit demanding. I do a lot at home and work and trying to squeeze in time to do my crafts and more has been hard. I have to be up at least by 5am. I work from mid-day into the night and I don’t get home until 9pm. I know awful hours. But it works for my family for now since I’m the one who takes the grandkids to school. Just two, the toddler stays home of course. I have three. My daughter works late night into the morning. And just like the rest of us, she needs her sleep too. I try to help her as much as I can. So when I have to deal with changes, I just get frustrated cause you have to learn all the new ways of doing things And just seems more difficult than easy. Like trying to insert a simple photo. Hint, Hint!!! But then again, that’s what I get from staying away from things for to long. I have no really to blame but myself. Calling it a night. I have a card that I’m trying to finish and I hope I can be up early in the morning to get it done. Don’t start work till 2 and it saturday so the kids are off from school. I’ll try to post it as soon as I’m done, I hope! Have to do some changes this coming year. One slow down on the my happy hours. Once I start I get distracted and all I want to do is watch movies and I know as much as I want to, I just don’t have time for it. so enough of that!! 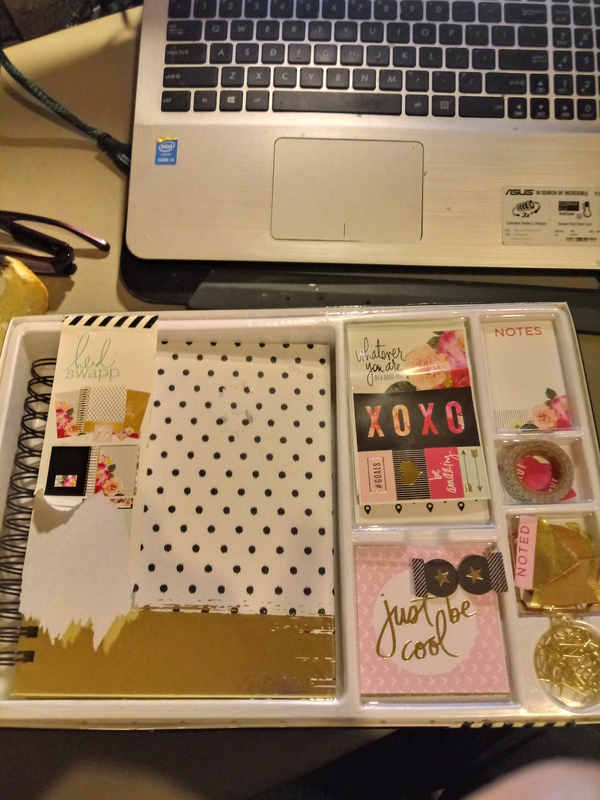 So my daughter got me this planner and I can’t wait to start with it. I have other stickers that I can use with it as well. So i’m trying upload the photo with no avail but i’ll keep trying. Tryinv to bee onvthe go with my blig but it doesncseem to work. if anything definitely in the evening I’ll keep you posted on my updates. Having a hard time uploading photo. I’ll keep trying! emmaperez1961 on Get out there!! ANM7 on Get out there! !